There is a great attraction in Belarus that was just recently found. This attraction are magnificent chalk pits. There are several places in Belarus, where you can find them. Most beautiful are the ones in Krasnoselsk township near the town of Volkovysk. There are also chalk pits near Soligorsk and Bereza. Four chalk pits near Volkovysk are the most popular among tourists and locals. They are also called "Belarusian Maldives". "Belarusian Maldives" appeared after the mining of chalk or limestone, which resulted in such a turquoise water. Turquoise-blue water and white cliffs make this place attractive primarily with its views. Krasnoselsk and other chalk pits are considered to be a technological area, and access here is limited. But when the summertime comes, a large number of curious people and romantics rush to this place to enjoy the wonderful view. It is hard to resist the temptation to see the "Belarusian Maldives" driving just a couple of hundred or even dozen kilometers. It is an incredible experience to stay overnight in a tent near such a miracle. Depth along the shore is not great, but in the centre it reaches 15 meters. Chalk pits area is huge, and the length is up to 4 km. Due to the fact that this attraction appeared recently, there is almost no well-equipped infrastructure here. But, if you're careful, nothing will disturb you from resting and enjoying the breathtaking "Belarusian Maldives". 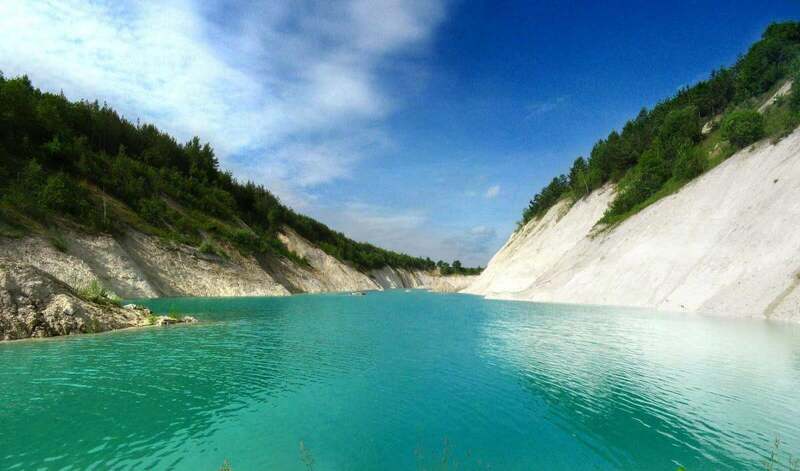 We really recommend you to visit Belarusian chalk pits, as it is one of the main attractions of the country.